What can’t Oyster Reefs do? Oyster reefs once proliferated along the Atlantic Coast of North America. For example, Chesapeake Bay only has 1% of their original oyster reef habitats. However, as shellfish aquaculture increases in popularity we are really seeing the benefits of these bivalves. Not only do they serve as a consumable good for many predators (including humans!) but they also filtrate pollutants in our coastal waters. The size of these reefs also create habitat for many coastal fisheries and invertebrates. What is not really known is how oyster reefs can protect us. Oyster reefs are often located in coastal nearshore waters. These reefs can potentially absorb wave energy during storm events or extreme hide tides by physically blocking waves as they head to shore. This often reduces waves or attenuates wave energy in coastal bays. Research conducted by Patricia Wilberg and colleagues from the University of Virginia quantified just how effective oyster reefs are at absorbing wave energy and protecting coastal developments. It isn’t just building developments these researchers were concerned about. In their study location, the Delmarva Peninsula in Virginia, USA, the reefs are close to coastal salt marshes. If the reefs do indeed help limit storm surge onto land, this could be extremely beneficial for the marshes. Salt marshes are not only hot spots for coastal birds and juvenile fish, but are also one of the most effective ecosystems at storing carbon dioxide. Salt marshes are a key ecosystem in the fight against climate change. American eastern oyster bed. Source: Wikimedia Commons. Two reefs of interest in this study were created several decades ago and the two others were manufactured just several years ago in the Delmarva Peninsula. The reefs were built from old shells or concrete blocks placed in the bay and eventually the American eastern oyster settled on the surface. 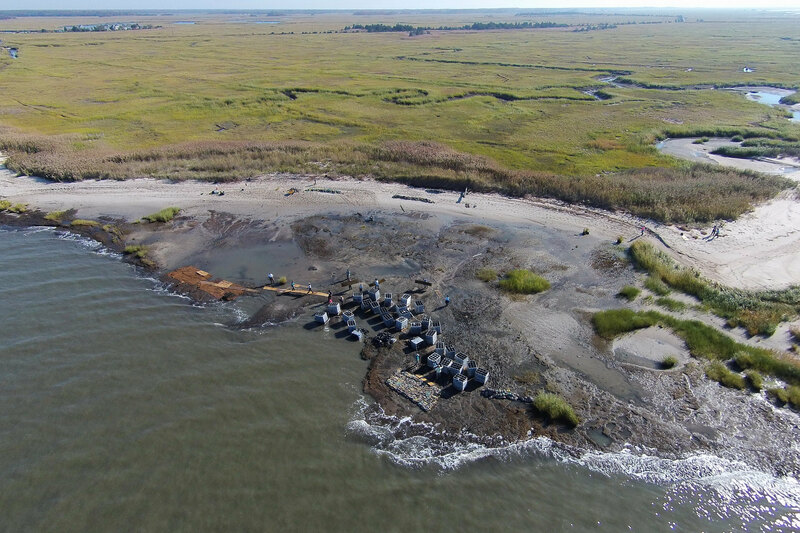 In addition to the four oyster reefs, the researchers also included a control site that had similar environmental conditions but without a man-made oyster reef present. Generally, the reefs are about 3-5 meters wide, 0.7 meters tall and about 150 meters long. Aerial view of the construction of a man-made oyster reef in New Jersey. Source: US Fish & Wildlife. Around each reef and control site, Wilberg and colleagues measured wind speed, wind direction, wave height, and wave direction from every direction of these little islands of oysters. During the study period from 2011 to 2017, the reefs were completely submerged beneath the water 75% of the time. For waves that were between 0.5-1 meters (1.5-3 feet) above the oysters, the reefs reduced the wave heights by an average of 30-50%. When the water depth increased to between 1-1.5 meters above the oysters, the reefs reduced the wave size by an average of 0-20%. As the water depth increased to above 1.5 meters above the reefs, less than 10% of the wave height was limited by the presence of the reefs. The findings by Wilberg and colleagues demonstrate that when reefs are close to the surface of the water and the waves aren’t too large that reefs play a large role in limiting wave energy. What CAN Oyster Reefs do? Oyster reefs can really help limit wave damage to coastal marshes and development on most days in a calm bay. Marshes are often found at elevations close to mean sea-level. Therefore, having oyster reefs nearby can also protect and benefit the marsh. Less waves hitting the marsh means less water submerging the marsh, resulting in less sediment being lost by erosion. While oyster reefs play an important role in protecting coastal marshes during small wave events, they lose effectiveness once the waves start to increase in height. However it’s critical that we appreciate the entirety of the total benefits reefs can do for our coastal communities: attenuate wave energy, filter pollutants, provide habitat, and support fisheries and local economies. It’s also worth highlighting some project that are helping oysters make a comeback. The Billion Oyster Project has planted 28 million oyster back into New York Harbor. Over the last three years collaborations between Rhode Island School of Design, Roger Williams University, and Rhode Island College are constructing an artificial oyster reef at the waterfront of Providence; an area that a century ago supported over a million oysters. I am in the process of earning my Master's in Natural Resources from the University of Connecticut. I am fascinated by potential shifts in biological processes due to climate change. My research is focused on how sea level rise and restoration practices may alter biogeochemical processes of salt marsh vegetation as well as the microbial community. When I'm not in the lab or covered in marsh muck, there's a god chance I'm down at the beach either surfing or fishing. Will Sponges Bulldoze Coral Reefs Faster in an Acidic Ocean? Copyright © 2019 envirobites. All rights reserved.